At almost 20 months, grandson Capt. Adorable hasn't quite yet grasped the concept of "if the shoe fits ...!" 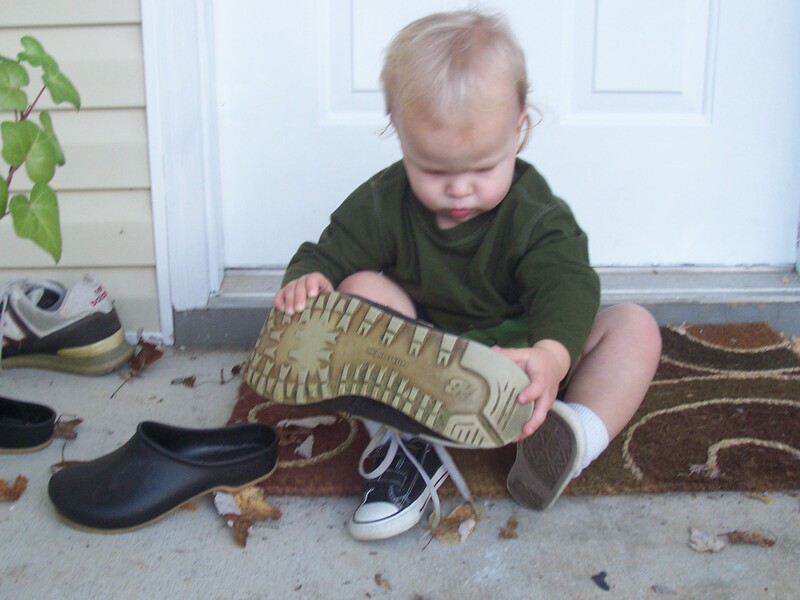 This entry was posted in Alabama, family, fashion and tagged Alabama, childhood, children, family, grandchildren, grandparenting, shoes by Coffee with Cathy. Bookmark the permalink. I just melt every time you show us this wonderful little boy. And I’m green with envy. My own children are “too busy” to start a family and I so need to be a grandma. I can’t say it enough; He is adorable! The Cap’t is getting cuter and cuter just want pinch those cheeks! That is SO cute! Thanks for stopping by and I’m glad to find your blog too. There is so much great stuff here, I off to see more. It’ll be fitting sooner than any of us will want it to!! I can’t believe how much he’s grown since I found your post. I love the size of his own little sneakers! Oh, thanks so much, y’all! You’ve made my day.